When people think of a Las Vegas vacation, many see a high price tag. Costs for a quality vacation rise even higher if the vacation needs to entertain not just one traveler, but an entire family. However, Las Vegas has a number of free or very affordable attractions and museums that are highly overlooked. Taking advantage of these free and family friendly attractions can easily reduce the cost of a family vacation without sacrificing the quality entertainment. M&M World is an attraction for all ages, located directly on the strip, with no admission cost. This colorful candy themed store is four stories of M&M fun. Each level is filled with brightly colored displays. Some of the most exciting displays include the rainbow wall of M&Ms and the Kyle Busch M&M Sponsored full sized replica race car. There are also a wide variety of souvenirs available for purchase on each level. The Aquarium at the Silverton Hotel is another quality attraction with no cost to visitors. Located in the Silverton Hotel, the 117,000 gallon aquarium is a beautiful sight to behold. Guests can watch scheduled fish feedings and even a mermaid show in addition to observing the spectacular array of tropical fish. Another family friendly option is the Wildlife Habitat at the Flamingo Hotel. Free to all guests, the Wildlife Habitat is home to more than 300 birds as well as an assortment of turtles and koi fish. The Habitat is adorned with lush plant life and features walkways along waterfalls, lagoons and ponds. While Las Vegas is not generally considered a destination for fish or wildlife, it is absolutely famous for its dazzling neon light displays. 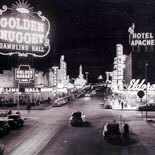 The Neon Museum is an open air museum located on Fremont Street. Here, guests can marvel at the ghosts of neon past when walking through the collection of retired neon signs. While the Neon Museum is free, tours of the separate Boneyard are only available for an admission fee. For guests seeking an educational opportunity during their Vegas vacation, the Marjorie Barrick Museum of Natural History is a free source of family fun. The museum is located in the University of Nevada Las Vegas campus and showcases temporary exhibits in addition to a large collection of art and historic artifacts. Just outside the museum is the Xeric Garden featuring dessert plant life. The museum is free to the public, but small donations are accepted and encouraged. These free and family friendly attractions are just a few of the entertainment options available at little or no cost during a Las Vegas vacation. When planning a trip to Vegas, be sure and visit https://www.trustedtours.com/store/las-vegas.aspx. Trustedtours.com is a great source for discounted tickets to other attractions and tours throughout Las Vegas. Don’t travel to Las Vegas without visiting www.trustedtours.com to keep vacation costs low. Combine the variety of already free or low cost Vegas attractions with the deals and discounts available at www.trustedtours.com for an unforgettable, family and budget friendly vacation.